Captiva is a bright, cheerful WooCommerce theme which will get you selling in a jiffy. 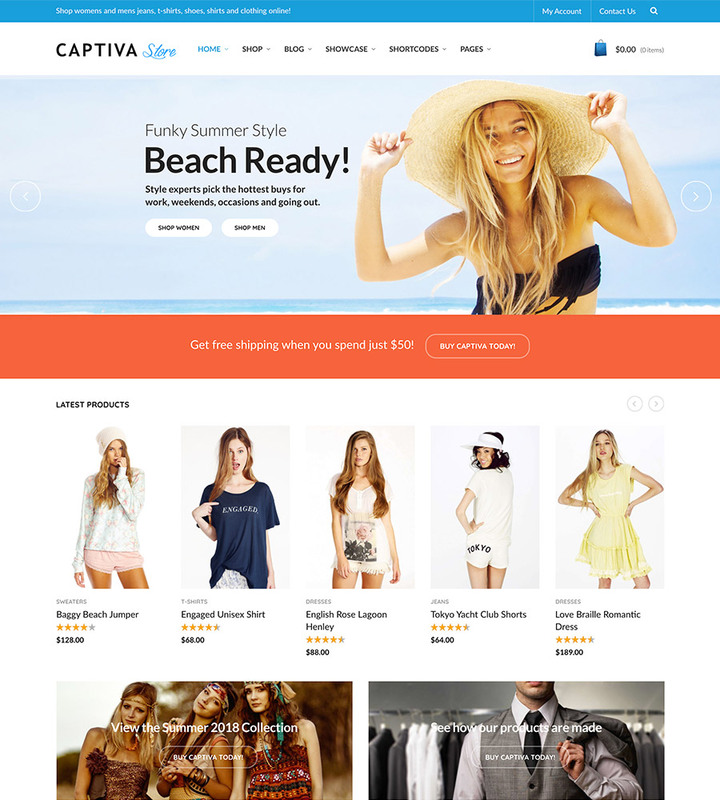 Captiva is a bright, fun, and stylish WooCommerce theme. It’s a great choice to build your store with. Your products will look beautiful and with dozens of customizable options it’s easy to brand a site. Easy tweaks include colors, typography and layouts. With a mega menu it’s easy to showcase product categories and display special offers. Plus, it’s a best-seller on ThemeForest with 900 happy customers so you know you’re in safe hands. It’s easy to quickly recreate a website similar to our demo site in minutes using the theme’s one-click installer. With Visual Composer and LayerSlider all the tools are at a customer’s disposal to build a great business site. Don’t waste hours reading manuals to get up and running – get a website built faster so you can start selling today. The product listings page is beautiful with sharp product images. There is an easily customizable sidebar. Drop in any widget you desire. These can include categories, price filters, a top rated products section and much more. Factory is fully compatible with the leading SEO plugin on the market, Yoast SEO and passes Google’s Structured Data Testing Test Tool. Plus, when you do need help we’re here for you. Our customers rave about our world class support team. First ever theme purchase for a client and it cut my designing time by 80%. Very easy to understand and highly customizable. These guys are doing a great job.